CNRP lawmakers Nhay Chamroeun and Kong Saphea were beaten bloody last Monday by men taking part in a CPP-aligned protest in front of the National Assembly to demand that deputy opposition leader Kem Sokha resign as the Assembly’s vice president. Mr. Rainsy has said he will reserve further judgment until the government has finished its investigation into the assaults that left Mr. Chamroeun and Mr. Saphea requiring surgery. The U.N. on Friday night stressed the need for the credibility of such an investigation. Ravina Shamdasani, a spokeswoman for the U.N.’s High Commissioner for Human Rights, issued a statement noting that the attack on the lawmakers appeared to be “an organized attack” and had occurred during a period of government hostility toward the opposition. “We welcome the establishment of an investigative commission into last Monday’s incident, but we stress that the investigation will only be credible if it is independent, impartial, thorough and prompt. Those responsible for the violence must be brought to justice,” Ms. Shamdasani said. 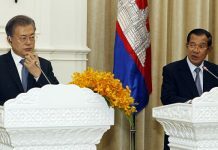 “We also urge the Government to take all necessary measures to ensure the security of all the democratically elected representatives of the people of Cambodia, irrespective of their political affiliation,” she added. A Human Rights Watch (HRW) report released Saturday, however, cast doubt on the likelihood of an independent inquiry, with interviews with both Mr. Saphea and Mr. Chamroeun indicating the attacks were well-organized and involved the help of parliamentary security staff. The report recounts the events leading up to the attacks on the lawmakers, which took place as they tried to leave the National Assembly shortly after the end of the protest outside its front gate. “Sophea and Chamraoen attempted to leave the National Assembly compound in separate cars. Both cars approached their usual exit gate on the northwest corner to find the gate closed, with a guard directing them south toward the main west gate,” the HRW report says. Mr. Saphea said that upon turning outside the gate, his driver saw a man in a red hat cross the street while speaking into a walkie-talkie and gesturing at the car, according to the report. National Assembly spokesman Chheang Vun, who is also a CPP lawmaker, declined to comment on the claims made in the HRW report. 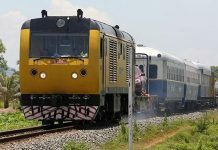 However, Council of Ministers spokesman Phay Siphan said it was the latest case of HRW trying to disparage the government. “You can make a lot of noise in the media, but it doesn’t help the victims. If Human Rights Watch has evidence, they should provide it. Whatever they have, send it to the special committee. 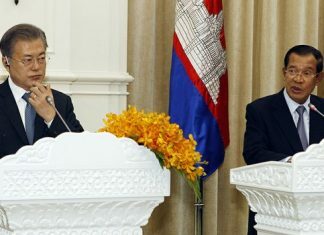 It’s better than sending it to The Cambodia Daily,” Mr. Siphan said. Many of the young men at last week’s protest had military haircuts, and civil society groups including Licadho and Adhoc have said their staff observed government security guards and police taking part in the protest but wearing civilian clothes. A number of people, including Mr. Rainsy, have also noted that the night before the protest Mr. Hun Sen expressed his fury at protests against him during recent visits to New York and Paris—warning of the protest in Phnom Penh against Mr. Sokha. Mr. Hun Sen has since distanced himself from the attacks, condemning them in a televised address on Wednesday and calling for authorities to arrest the perpetrators while also suggesting the beatings may not have been political. Deputy National Police Commissioner Chhay Sinarith, who was appointed to the CPP’s new “propaganda and education committee” in September, has promised that the special committee created by the ministry will find the perpetrators. The attacks against Mr. Chamroeun and Mr. Saphea last Monday presaged a week of drama as the nation’s military joined calls to remove Mr. Sokha, rallying troops along the Thai border with signs calling for his ouster. The events led up to the CPP’s 68 lawmakers on Friday meeting to oust Mr. Sokha in a vote boycotted by the CNRP, which has argued that it was unconstitutional because there is no procedure for replacing an Assembly president or vice president unless they die or resign. On Saturday, Mr. Sokha said the CNRP will not nominate a replacement candidate for the position. “Sam Rainsy and I, Kem Sokha… discussed and agreed that the CNRP will not propose a National Assembly vice president candidate, as [my removal] contradicts the Constitution and violates the deal between the two parties,” Mr. Sokha wrote on his Facebook page. CPP spokesman Sok Eysan said such a decision would mean the position—handed to the CNRP as part of the July 2014 political deal—will remain vacant. “It is the CNRP’s quota and the CPP will not grab it, because there was a deal on July 22, 2014. If there’s no Kem Sokha, the place will be empty…and it’s up to them if they want to replace it,” Mr. Eysan said. Mr. Rainsy, who has been in Europe as the past week’s events have unfolded, said in an email Sunday that he will be returning to Phnom Penh on Tuesday. “Earlier that day, upon my arrival from Paris, I will be visiting the two injured CNRP National Assembly members who are being treated at a hospital in Bangkok,” he said.